Today after I birded at Six-mile Cypress Preserve, which had very little activity, I noticed several white pelicans flying around the ponds at the 'Metro Ponds'. This at the intersection of Six-mile Parkway and Metro Parkway. So I had to make a stop. There had to be about 180 American White Pelicans situated here today. Other species seen here included Swallow-tailed Kite, Blue-winged Teal, Greater Yellowlegs, Black-necked Stilts, Great Egrets, Snowy Egrets, Little Blue egrets, Tricolored Herons, Common Gallinule, Boat-tailed Grackles, Red-winged Blackbirds, Least sandpipers, and some Rock Pigeons. Did look around for any possible boblinks, but not today. The spring migration fall-out we are experiencing along Florida's Gulf Coast has benefited us for several days know. Today is day four of the many good sightings continuing at Lee County's Sanibel Lighthouse. The birds are thinning out and will be probably be gone in a day or so with more favorable winds and full bellies. I returned both Wednesday and Thursday to the search for a rarely seen in southwest Florida Black-billed Cuckoo. Well I dipped on the bird, but was able to tally some good migrants. I was able to add Yellow-billed Cuckoos, Blue and Rose-breasted Grosbeaks, Summer and Scarlet Tanagers, Baltimore and Orchard Orioles, Lincoln Sparrows, Indigo Buntings, Eastern Wood-Pewees, Verry, Swansen's Thrush, Magnolia warbler, Black-and White Warbler, Blackpoll Warbler, Yellow Warbler, Palm Warblers, Ovenbird, Common Yellowthroat, American Redstart, Hooded Warbler, Prairie Warbler, Red-eyed Vireo and Eastern Screech Owl. Other additional sightings around the state include bay-breasted warblers, kentucky warblers, cerulean warblers, blackburian warblers and warbling vireos at Ft Desoto park in Tampa Bay and a varied thrush down in Naples in Collier County. Toward sundown I caught-up with Bob Pelkey at the drying-up pond at Metro Parkway and Six-mile Cypress Parkway were we found several Black-necked Stilts, a Solitary Sandpiper, a few Semipalmated Sandpipers, a couple of dozen Least Sandpipers and at least one Western Sandpiper. Other birds included Mottled Ducks, Blue-winged Teal, a Swallow-tailed Kite, Wood Storks and the usual waders. Its been a good week. There is also some anticipation that a repeat blow could happen this weekend and bring-in a fresh wave of migrants. I will also be checking Harn's Marsh next week for any bobolinks as I had found them there in the first week of May these past two years. The past two days the spring migration birding along the Florida Gulf Coast has been awesome. All the migrant traps along the coast have hosted many of the warblers, tanagers, orioles, grosbeaks etc. that have usually just fly past us. But weather conditions brought them in on Saturday night and the projected winds for tomorrow should carry them away. Sunday I had some time to bird and was not sure if we want any fall-out from the weather. I had already a had a couple of unsatisfying attempts on Sanibel Island in the past week, which can get expensive to make extensive visits, with all of the tolls and parking fees. So I first tried Bunche Beach for any interesting pelagics that may have blown in. Found a very high tide and heavy surf and few birds. My best find was an FOS Semipalmated Sandpiper and a Marbled Godwit. Next tryed Six-mile Cypress Slough Preserve which was also very quite save for a Scarlet tanager that showed up just as I was leaving. Called Dr Jose to report my find, but he and about every other local birder were at the Sanibel Lighthouse and at Ding Darling Refuge. He reported an awesome assortment of birds were on-hand. I was there in about 20 minutes. To bad my camera was out-of-order as there several photo opportunities such as a male Summer Tanager posing right off the trail. Would have been a great shot. Indigo Buntings were everywhere and lots of Rose-breasted Grosbeaks, Baltimore Orioles, Orchard Orioles, Scarlet Tanagers and FOS Eastern Kingbirds. Other sights included a Gray-cheeked Thrush, Swainsen's Thrush, Northern Waterthrushs, Black-and-White Warblers, American Redstart, a Blue Grosbeak, Tennessee Warbler, Red-eyed Vireo, Dickcissel, a Black-throated Green Warbler, a female Painted Bunting ( the males have already left), Barn Swallows and Chimney Swifts. Additional species witnessed by other birders on Sunday and Monday included a scissor-tailed flycatcher, verry, wood thrush, yellow-billed cuckoos, bank swallows, northern rough-winged swallows, ruby-throated hummingbirds, cedar waxwings, blue-winged warblers, ovenbird, magnolia warbler, yellow warbler, black-throated blue warbler, hooded warbler and Lincoln sparrow. 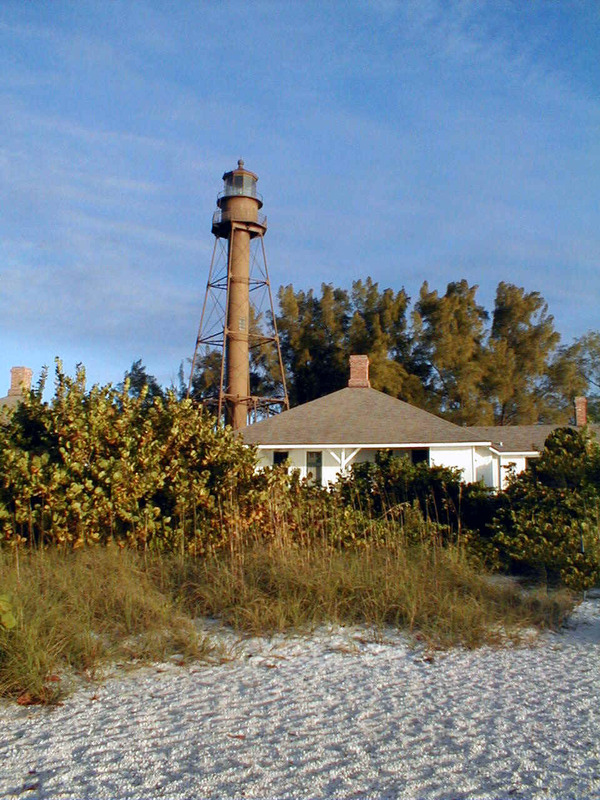 Headed over to the Sanibel Lighthouse to look for any migrants. But no migrants were on-hand today. Just the usual Ospreys, Starlings, Fish Crows, Eurasian Collared Doves and Brown pelicans. Did see a Magnificent Frighetbird while crossing the Sanibel Causeway. Found Ding Darling National Wildlife Refuge to be very quite as well. With a high tide, waders and shore birds were scarse. Got a few pics of Willets and Red-breasted Mergansers. 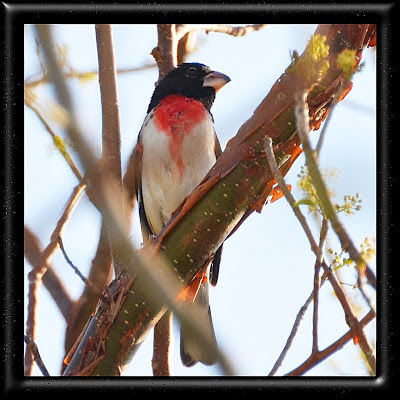 The only songbirds I saw were Northern Cardinals, a Pileated Woodpecker and Mourning Doves. Kept a look-out for any mangrove cuckoos or black-whiskered vireos that might be active near the wildlife drive. An articule in the local paper reported on a year long survey being conducted at Ding Darling on the mangrove cuckoo. When April arrives I try to schedule a couple of trips up to Ft Desoto Park in Tampa Bay in hopes of finding spring migrants. Today the spring migrants were not very numerous and only a sampling was evident on this visit. The shorebirds, gulls, terns and such were more evident. Hundreds of Royal terns were on-hand plus a few Forster's and Least Terns. Lots of Laughing Gulls and a couple of Herring and Ring-billed Gulls were still around. Found a couple of American Oystercatchers, a Wimbrel, Ruddy Turnstones, Dunlins, Short-billed Dowitchers, Western and Least Sandpipers, Willets, Marbled Godwits and Sanderlings. As for the migrants I was able to find the Tennessee Warbler and Ruby-throated Hummingbirds at the mulberry trees, plus Orchard Orioles, and a great many Cedar Waxwings, Indigo Buntings, a pair of Northern Parulas, a pair of Worm-eating Warblers and a couple of Prairie Warblers. At the east Beach Turnaround I had about six Lesser Scaups and several Red-breasted Mergansers and several Barn Swallows swooping overhead. Also found a couple of Reddish Egrets at the lagoon. One was the usual Red plumage and the other was a white-morphed Reddish Egret. I'll try to get back here again before migrantion ends in the hoops of greater prospects. Spring migration has begun here in beautiful Southwest Florida. We are not located on one of the major spring migration routes through the state, but sometimes we can have a real good day. Last spring most of the migrants had favorable winds and just shot right past us to points north. It's possible that we'll have a repeat this season, but usually our best results are at the Sanibel Lighthouse. A couple of years ago I visited day as large numbers of birds did stop here with the telephone wires packed with exhausted Purple Martins and Barn Swallows. Today I stopped by in the afternoon and found zero migrants after a two hour search. But on Easter Sunday we did have a few good hits. We had plenty of eyes as several birders were on hand including several friends like Dr Jose Padilla, Vince McGrath, Wes, Gary Lee and others like Don and Lillian Stokes. Best bird was a continuing Blue-winged Warbler first reported by the Stokes a few days ago. We also had Black-and White Warbler, Palm Warbler, Hooded Warbler, Worm-eating Warbler, Red-eyed Vireo, White-eyed Vireo, Blue Grosbeak, Indigo Bunting, Pine Warbler, Northern Parula, Coopers Hawk, Cliff Swallow, Northern Rough-winged Swallow, Purple Martin, Barn Swallow, Fish Crow, Cedar Waxwings, Gray Catbirds and a late Common Loon. April is also the time that the local reptile population starts becoming active as the temps rise and the wetlands dry up. Snakes and lizards are more active, turtles are looking for nesting sites and the larger gators are forcing the smaller gators to look for new digs as the ponds shrink. Just last night I found a displaced yearling baby gator wandering the property at work. In years past much larger gators had managed to enter the property. So we are bit more cautious when working about the property at night this time of year..
One very reliable location in Lee County for finding the endangered Florida Scrub-Jay is in the Festival Park area of Cape Coral. But there presence has become a major headache for that city. The City had big plans for the location to create a recreational area for community sponsored festival and sporting events. Some $27 Million had already been spent acquiring the property. But development came to halt with discovery of three families of the Scrub-Jays about 2005 on the property. As the birds are on the National Protected Species List, they can not be disturbed. Now what is the City to do? It comes down to two chooses. Do nothing and hope they go away or go ahead with a mitigation plan called a Habitat Conservation Plan. At a price tag of $780,025, to the City, they could get permits to go forward with development. The funds will be used to manage and maintain scrub-jay habitat at Alva Nature Park. The birds will not be moved. But to cover the costs, the city council is considering a one-time fee assessed to all property owners in the Cape, of not more than eight to ten dollars. As the citizens have taken great measures to protected their beloved burrowing owls, I can't see how a few dollars could stand in the way. Hopefully the future development will include suitable habitat for the birds so that they will remain and be enjoyed by so many. April Fools' Day marked an announcement by Vince McGrath of Ft Myers that he had a very unusual visitor to his backyard feeders. Aside from the colorfully Blue and Painting Buntings, a first year male Lazuli Bunting had arrived in the yard. This is a very unusual find in Florida. A check on ebird has the last report to one, four years ago, also in Lee County at the White's feeders in Alva. A hand-full of other reports date back several more years. So, this little guy is certainly a rare find. This morning I paid a visit to Vince's house and was treated to my first sighting of the species. Others birds frequenting the yard included the Indigo and Painted Buntings, Blue Jay, Gray Catbirds, Eurasian Collared Doves, Mourning Doves, Northern Cardinals and Cedar Waxwings could be heard, but were not seen. Vince has had a lot of visitors so far and more folks were stopping by as we left to check the nearby Sanibel Lighthouse for migrants. Turned out to be a disappointing stop. Lots of Easter time visitors. but low on birds. Did get a FOS Gray Kingbird and a beautiful Pileated Woodpecker. Baby Ospreys could be seen being feed by their momma and a couple of Brown-headed Cowbirds were perch high in a snag. Later I headed over to Six-mile Cypress Slough Preserve, which was also very quite. However near the southern boundary of the preserve along Six-Mile Cypress Parkway I was lucky to notice a a nice kettle of mixed species including American White Pelicans, a Bald Eagle, Wood Storks, Black Vultures and Swallow-tailed Kites. Was also able to add an American Kestrel and a flock of Cedar Waxwings. About five o'clock I get a text from Bob Pelkey about Least Terns at Bunche Beach. So off I go. The tide was low and crowd on the beach was thinning and the birding was good. I did get my FOS Least Terns, plus Sandwich and Royal Terns. Hundreds of Short-billed Dowichers and Dunlins were present. Found four plover species - Black-bellied, Piping, Wilson's and Semipalmated. Could also add Sanderings, Ruddy Turnstones, Willets, a lone Marbled Godwit, a trio of Bald Eagles, Ospreys, dancing Reddish Egrets, White Ibis and Red-breasted Mergansers. The mergansers were a surprise. I was able to find them after some moron in a self powered para-sailing apparatus came flying in low over the beach and startling the birds. As things settled downed the ducks came in close by. Other-wise I would have probably missed them. I had figured that all of the mergansers, like the horned grebes and common loons had already headed north. You just never know what you'll find when out birding.